Ureteroscopy for the purpose of lithotripsy or stone extraction inevitably causes some degree of trauma to the ureter. Traditionally, ureteral stents were placed routinely to prevent renal colic or ureteral stricture formation. Although stenting effectively prevents the symptoms of colic, it may cause symptoms such as bladder irritation, flank pain, dysuria, or hematuria. 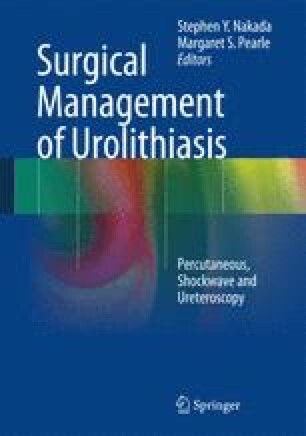 In the early years of ureteroscopy, the use of larger caliber rigid scopes always required dilation and subsequent stenting; and at that time, only externalized ureteral catheters of relatively rigid materials were available. These were uncomfortable, and the symptoms required hospitalization. Over time, indwelling double J-type stents of more tolerable materials were developed, which allowed for internal stenting, decreased levels of patient symptoms, and outpatient surgery. As advances in technology have given us scopes with decreasing diameter, surgery has become less traumatic for the ureteral tissues, prompting Urologists to question the need for routine stenting. Clearly, properly selected ureteroscopic procedures may be routinely performed without the need for postoperative stents. From a drainage standpoint, stents function without problem. However, they cause morbidity, which may be moderate for some patients and much more severe for others. These symptoms have not only resulted in recent advancements but drive current areas of research into stent design. Future study must elucidate the mechanism that causes morbidity, which will in turn allow for better-directed research in stent design and medical management of symptoms.